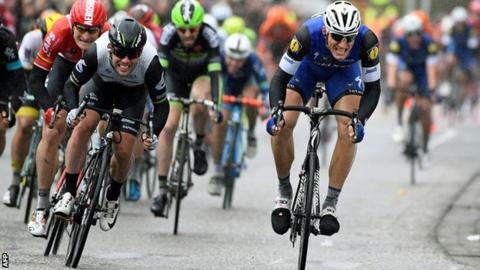 Mark Cavendish was beaten in a sprint finish by German Marcel Kittel in the one-day Scheldeprijs race. Manxman Cavendish, riding for Team Dimension Data, was well positioned on the wheel of Kittel entering the finishing straight in Belgium. But the Etixx-Quick-Step rider narrowly held on to win in four hours 54 minutes and five seconds - his fourth win in the event in the past five years. Germany's Andre Greipel, riding for Lotto-Soudal, was third. Cavendish was bidding for a fourth victory in the race himself, having won in 2007, 2008 and 2011.